The B. F. Bryant Prize for Excellence in Teaching is awarded annually to a graduate teaching assistant in the Department of Mathematics. 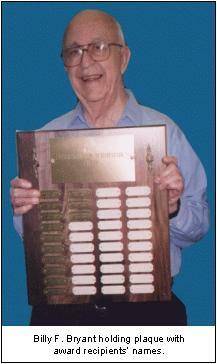 The B.F. Bryant award was established in 1987 in honor of Billy F. Bryant, Professor of Mathematics, Emeritus, who taught at Vanderbilt from 1948 to 1986. The award is given each spring to a graduate teaching assistant who has demonstrated concern for and accomplishments in teaching, qualities that characterized the career of Professor Bryant. Bryant received a B.S. from the University of South Carolina, a master’s degree from Peabody College, and his doctoral degree from Vanderbilt. During his 38-year career in the Department of Mathematics, he directed the research in topology of seven Ph.D. students and received the Sarratt Award for Excellence in Undergraduate Teaching and the Thomas Jefferson Award for service in the governance of the University. He served as the chair of the Department of Mathematics from 1970 to 1976. 1991 – Thomas P. Bass, Jr.
1987 – Marvin E. Glover, Jr.